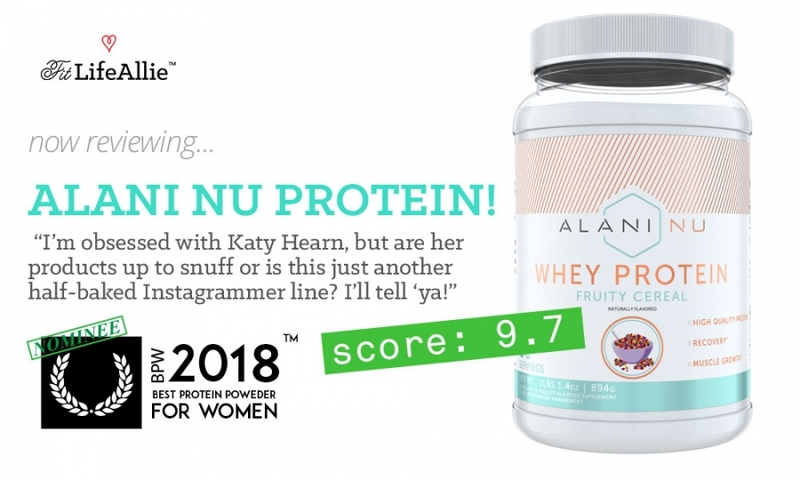 Alani Nu Reviews are tough to find as this Katy Hearn supplement brand is literally BRAND spanking new in the past few weeks. But lucky for you, I was able to get my hands on all three flavors of the new Alani Nu protein and do a full breakdown of the products. In this Alani Nu protein review, I’m actually going to talk about four flavors. There are three flavors of whey, and then one vegan flavor. So instead of break things down into two separate reviews, I figure I’ll just do one massively well-written Alani Nu protein review covering the whey vs vegan flavors. In this post I’ll discuss flavors primarily, but also go into detail around the ingredients of each Alani Nu version and summarize the quality of each. At the end I’ll sing the praises of Katy Hearn’s taste in packaging because I think Alani Nu looks absolutely brilliant. Let’s kick off this Alani Nu Review with flavors! Alani Nu is a funky name, there is no denying that. Katy actually talked about the meaning of the name on her Instagram a while back, and I believe the phrase is steeped in Hawaiian culture as something about renewal. Anyways it’s not that important but in case you were curious about the Alani Nu name I think almost everyone is Lol. But you know what? The name doesn’t matter. The products DO. And that’s what I’m going to talk about today. The Alani Nu flavoring, the formulations, and even the packaging to see if Katy Hearn has actually created a supplement line to be reckoned with. Let’s begin by talking about Alani Nu Protein FLAVOR. What’s the Best Flavor of Alani Nu Protein? The chocolate flavor of Alani Nu Whey protein was a great way for my taste buds to get acclimated to the STYLE of flavor that Alani Nu proteins use. I’ve reviewed literally SO many different protein powders that I’ll start to even recognize similarities between different brands. And it’s so funny because Katy Hearn’s chocolate Alani Nu flavor reminded me SO much of Adaptogen Tasty Whey protein. I almost wonder if they used the same flavoring specialist or something. I don’t know how it all works but I think this Alani Nu Whey protein in the chocolate flavor is very very good. It has deep, sweet, true ‘chocolate’ flavors somewhere between milk and dark chocolate, which means it’s very drinkable for everyone without being too bitter, but has enough complexity to be intriguing to a real chocolate enthusiast, such as myself. The second Alani Nu flavor that I tried was the Fruity Cereal flavor. I know right? A LITTLE bit more of an unusual flavor than straight up Chocolate that I tried first, LOL. But this flavor was ALSO on point. I’d honestly say that the Fruity Cereal flavor of Alani Nu Whey Protein is even superior to Ghost Whey’s Cereal Milk flavor. I was laughing because I wonder if Katy Hearn and her husband (and soon to be father of her child) Hayden (who seems to be helping with the supplement side of things) had actually just copied Ghost with this flavor idea. You know the funny thing is that they even OUTDID Ghost with their Alani Nu cereal flavor. It’s actually delicious. It’s as if you mixed a cereal bowl half full of Fruity Loops and half full of Lucky Charms, and then drank the milk. It’s sweet, a little salty, and really does bring you right back to childhood. So good! This flavor of Alani Nu was probably my least favorite even though don’t get me wrong I am OBSESSED with pancakes. You guys know that from my Instagram Lol. Alani Nu Pancake Brunch protein has the nice, smooth texture as the other two flavors that I reviewed but for me the flavors were not quite as pleasing. Having grandparents in New England, you all know that I have been spoiled by having real maple syrup shipped to us in San Diego my whole life. And unfortunately the Alani Nu syrup taste just wasn’t real enough for my pampered taste buds. But if you’re more of an ‘Aunt Jemima’ fan, than the Alani Nu Pancake Brunch flavor is probably going to rock your socks because it has all the other great characteristics of the other two in terms of texture, balance of salty/sweet, and drinkability. The Vegan chocolate flavor of Alani Nu is, well, okay. I think unless you are a Vegan, you are probably better off going with the Fruity Cereal Alani Nu Whey. But that’s something is true for everyone. Unless you are Vegan, don’t drink the Vegan proteins. They just don’t taste as good. But Alani Nu holds there own on the Vegan protein. If I compare it to some of the big time Vegan proteins out there like Tone It Up, or Vega Sport, or even Ora Organic, I think Alani Nu falls somewhere right in the middle of the pack. You can definitely taste the pea protein in the Alani Nu Vegan protein, and it is my suspicion that this is primarily a pea protein formula, with a tiny bit of the pumpkin and watermelon proteins dusted in. I think Alani Nu should’ve bumped up the sweetness and the chocolate-y-ness just a little more to overpower the earthy notes of the pea protein, but, yeah. It’s okay. Definitely drinkable but not quite as good as the Alani Nu Whey flavors. So to summarize. The Alani Nu Whey flavors are exceptional, and the Vegan flavor is just okay. Unless you are a very serious Vegan, I would go with the Alani Nu Whey protein. If you ARE a Vegan, you still might enjoy the Alani Nu product, though it does seem that they didn’t go ‘all-in’ on perfecting the Vegan iteration of Alani Nu. But who knows, they are such a new brand. They’ll probably continue to improve it! Now that we’ve talked a little bit about the Alani Nu Protein flavors. What’s in Katy Hearn’s Protein Products? From a formulation point of view, these products are relatively simplistic, and I would say that is in a good way. Alani Nu uses very traditional formulations, but does have a couple tweaks that make them distinct enough to define as a unique brand. Let’s breakdown the ingredients in each and then I’ll give you my notes on each Alani Nu iteration. Whey Protein Hydrosylate, Whey Protein Isolate, VitaCherry Sport, Ticaloid Ultrasmooth (Cellulose Gum, Xanthan Gum, Carrageenan), Salt, Silica, Natural Flavors, DigeZyme (Protease, Amylase, Lactase, Lipase, Cellulase), Beet Root Extract, Sucralose, Acesulfame Potassium. My Notes: The ingredients in the dairy based Alani Nu proteins are pretty standard. You have two different whey proteins (hydroslate and isolate), coupled with some digestive enzymes and then some tart cherry to provide recovery benefits. I think the formula is therefore simple, but pretty well thought-out. I like that they added the tart cherry to help recovery. My Notes: I think, again, this is pretty standard for a whey protein product. The sodium (salt) might be just a tough higher than I’d like to see but I understand you gotta have salt to make it taste good probably. No big surprises here looking at the Alani Nu macros. Let’s look at the Vegan now. Pea Protein, Watermelon Seed Protein, Pumpkin Seed Protein, Cocoa Powder, Natural Flavors, Guar Gum, Monk Fruit Extract, Organic Stevia Leaf Extract, Silica. My Notes: As I said before, it seems like the Vegan protein was less of a priority than the Alani Nu Whey product. That being said, this is not a BAD Vegan protein. It is just basic. Again, this is most likely over 95% pea protein with a tiny bit of watermelon and pumpkin sprinkled in. You REALLY taste the pea protein flavor in the Alani Nu Vegan protein. My Notes: Again, the macros are not really surprising in any way, but the Vegan protein is just slightly more caloric due to having a little bit more carbohydrate in the form of fiber. The Alani Nu Vegan protein actually has over 3 grams. This Alani Nu Vegan protein also has twice the amount of salt as the Whey- actually 11% of your RDV of salt which is interesting to note. But again that’s probably all for trying to flavor gross-tasting Vegan protein sources. Alani Nu Packaging is SO Pretty. I’ve literally been waiting all review to tell you how brilliant of a job Katy Hearn and co. did on their packaging. I think Alani Nu is such an amazing departure from the typical supplements we are used to seeing from these ‘instagram’ celebrities. Between Calum Von Moger’s light-hearted (slash just plain old foolish) Staunch line, Brad Martyn’s Origin, and even Cass Martin’s WRKETHIC line…these have left much to be desired. From a brand perspective, I think Katy Hearn and Alani Nu are the first ones to actually get it right. These products not only use thoughtful formulas but the aesthetics are simply gorgeous. Katy opted for a lighter color palette of teals and subdued pink shades. Even the colors give you a certain comfort level in the safety and quality of the products within. Alani Nu uses plenty of white space as relief and to give the graphics plenty of breathing room to attract the customer’s attention. I think graphically speaking the labels are very simple, using simple techniques to create movement and sophistication. A thick teal bottom border sits handsomely along the lower edge of each label while an understated diagonal line pattern flows throughout the upper region of each label. The Alani Nu logo speaks proudly from below the pattern. A cute flavor illustration is also centered prominently on the lower portion of each Alani Nu product to show the customer what their taste buds are in for. Again, even though it’s not earth-breaking stuff from an artistic standpoint, Alani Nu products look incredible. I also like that they use clear colored jars to reinforce an overall feeling of transparency to the consumer. Really, REALLY good job on the Alani Nu branding, Katy and team! Ok. That just about does it for this Alani Nu review guys. Let’s wrap it up with a complete summary.